For the 19th century politician, see Henry Frick (politician). 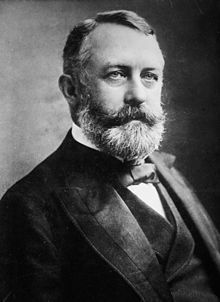 Childs Frick, Martha Frick, Helen Clay Frick, Henry Clay Frick Jr.
Henry Clay Frick (December 19, 1849 – December 2, 1919) was an American industrialist, financier, union-buster, and art patron. He founded the H. C. Frick & Company coke manufacturing company, was chairman of the Carnegie Steel Company, and played a major role in the formation of the giant U.S. Steel manufacturing concern. He also financed the construction of the Pennsylvania Railroad and the Reading Company, and had extensive real estate holdings in Pittsburgh and throughout the state of Pennsylvania. He later built the historic neoclassical Frick Mansion (now a landmark building in Manhattan), and upon his death donated his extensive collection of old master paintings and fine furniture to create the celebrated Frick Collection and art museum. However, as a founding member of the South Fork Fishing and Hunting Club, he was also in large part responsible for the alterations to the South Fork Dam that caused its failure, leading to the catastrophic Johnstown Flood. His vehement opposition to unions also caused violent conflict, most notably in the Homestead Strike. Frick was born in West Overton, Westmoreland County, Pennsylvania, in the United States, a grandson of Abraham Overholt, the owner of the prosperous Overholt Whiskey distillery (see Old Overholt). Frick's father, John W. Frick, was unsuccessful in business pursuits. Henry Clay Frick attended Otterbein College for one year, but did not graduate. In 1871, at 21 years old, Frick joined two cousins and a friend in a small partnership, using a beehive oven to turn coal into coke for use in steel manufacturing, and vowed to be a millionaire by the age of thirty. The company was called Frick Coke Company. Thanks to loans from the family of lifelong friend Andrew W. Mellon, by 1880, Frick bought out the partnership. The company was renamed H. C. Frick & Company, employed 1,000 workers and controlled 80 percent of the coal output in Pennsylvania, operating coal mines in Westmoreland and Fayette counties, where he also operated banks of beehive coke ovens. Some of the brick and stone structures are still visible in both Fayette and Westmoreland Counties. Shortly after marrying Adelaide Howard Childs, in 1881, Frick met Andrew Carnegie in New York City while the Fricks were on their honeymoon. This introduction would lead to an eventual partnership between H. C. Frick & Company and Carnegie Steel Company and, eventually, to United States Steel. This partnership ensured that Carnegie's steel mills had adequate supplies of coke. Frick became chairman of the company. Carnegie made multiple attempts to force Frick out of the company they had created by making it appear that the company had nowhere left to go and that it was time for Frick to retire. Despite the contributions Frick had made towards Andrew Carnegie's fortune, Carnegie disregarded him in many executive decisions including finances. At the suggestion of his friend Benjamin Ruff, Frick helped to found the exclusive South Fork Fishing and Hunting Club high above Johnstown, Pennsylvania. The charter members of the South Fork Fishing and Hunting Club were Benjamin Ruff; T. H. Sweat, Charles J. Clarke, Thomas Clark, Walter F. Fundenberg, Howard Hartley, Henry C. Yeager, J. B. White, Henry Clay Frick, E. A. Meyers, C. C. Hussey, D. R. Ewer, C. A. Carpenter, W. L. Dunn, W. L. McClintock, and A. V. Holmes. The sixty-odd club members were the leading business tycoons of Western Pennsylvania, and included among their number Frick’s best friend, Andrew Mellon, his attorneys Philander Knox and James Hay Reed, as well as Frick's occasional business partner Andrew Carnegie. The club members made inadequate repairs to what was at that time the world's largest earthen dam, behind which formed a private lake called Lake Conemaugh. Less than 20 miles (32 km) downstream from the dam sat the city of Johnstown. Cambria Iron Company operated a large iron and steel work in Johnstown and its owner, Daniel J. Morrell, was concerned about the safety of the dam and the thoroughness of repairs made to it. Morrell had even sent his own engineer to inspect the site but little was done in the long run to satisfy his concerns and the matter was largely dropped after Morrell's death in the mid-1880s. Poor maintenance, unusually high snow melt and heavy spring rains combined to cause the dam to give way on May 31, 1889, resulting in the Johnstown Flood. Other sources blame a screen placed across the spillway by the club to prevent fish from escaping, as a cause, when debris accumulated during a storm. When word of the dam's failure was telegraphed to Pittsburgh, Frick and other members of the club gathered to form the Pittsburgh Relief Committee for assistance to the flood victims, as well as determining never to speak publicly about the club or the flood. This strategy was a success, and Knox and Reed were able to fend off all lawsuits that would have placed blame upon the club’s members. With a volumetric flow rate that temporarily equalled that of the Mississippi River, the flood killed 2,209 people and caused US$17 million of damage (about $450 million in 2015 dollars). Although Cambria Iron's facilities were heavily damaged, they returned to full production within a year and a half. In 1881, Frick, already wealthy, took control of his grandfather's whiskey company, Old Overholt. Frick split ownership with Andrew Mellon and one Charles W. Mauck; each owned one-third of the company. The family's whiskey company was a sentimental side business for Frick, and was headquartered in Pittsburgh's Frick Building. In 1907, as prohibition became more popular across the country, Frick and Mellon removed their names from the distilling license, although they retained ownership in the company. Upon Frick's death in 1919, he left his share of the company to Mellon. Frick and Carnegie's partnership was strained over actions taken in response to the Homestead Steel Strike, an 1892 labor strike at the Homestead Works of the Carnegie Steel Company, called by the Amalgamated Association of Iron and Steel Workers. At Homestead, striking workers, some of whom were armed, had locked the company staff out of the factory and surrounded it with pickets. Frick was known for his anti-union policy and as negotiations were still taking place, he ordered the construction of a solid board fence topped with barbed wire around mill property. The workers dubbed the newly fortified mill "Fort Frick." With the mill ringed by striking workers, Pinkerton agents planned to access the plant grounds from the river. 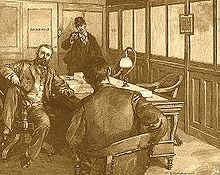 Three hundred Pinkerton detectives assembled on the Davis Island Dam on the Ohio River about five miles (8 km) below Pittsburgh at 10:30 p.m. on the night of July 5, 1892. They were given Winchester rifles, placed on two specially-equipped barges and towed upriver with the object of removing the workers by force. Upon their landing, a large mêlée between workers and Pinkerton detectives ensued. Ten men were killed, nine of them workers, and there were seventy injuries. The Pinkerton agents were thrown back, and the riot was ultimately quelled only by the intervention of 8,000 armed state militia under the command of Major General George R. Snowden. During the confrontation Frick issued an ultimatum to Homestead workers, which restated his refusal to speak with union representatives and threatened to have striking workers evicted from their homes. Among working-class Americans, Frick's actions against the strikers were condemned as excessive, and he soon became a target of even more union organizers. Because of this strike, people like Alan Petrucelli had thought that he is depicted as the "rich man" in Maxo Vanka's murals in St. Nicholas Croatian Church, but the Society to Preserve the Millvale Murals of Maxo Vanka (which works to preserve the artwork) says it depicts Andrew Mellon. Berkman's attempt to assassinate Frick, as illustrated by W. P. Snyder in 1892, originally published in Harper's Weekly. In 1892, during the Homestead strike, anarchist Alexander Berkman attempted to assassinate Frick. On July 23, Berkman, armed with a revolver and a sharpened steel file, entered Frick's office in downtown Pittsburgh. Frick, realizing what was happening, attempted to rise from his chair while Berkman pulled a revolver and fired at nearly point-blank range. The bullet hit Frick in the left earlobe, penetrated his neck near the base of the skull, and lodged in his back. The impact knocked Frick down, and Berkman fired again, striking Frick for a second time in the neck and causing him to bleed extensively. Carnegie Steel vice president (later, president) John George Alexander Leishman, who was with Frick, was then able to grab Berkman’s arm and prevented a third shot, probably saving Frick's life. Frick was seriously wounded, but rose and (with the assistance of Leishman) tackled his assailant. All three men crashed to the floor, where Berkman managed to stab Frick four times in the leg with the pointed steel file before finally being subdued by other employees and a carpenter, who had rushed into the office. The carpenter also hit Berkman with a hammer during the scuffle. Frick was back at work in a week; Berkman was charged and found guilty of attempted murder. Berkman's actions in planning the assassination clearly indicated a premeditated intent to kill, and he was sentenced to 22 years in prison. Negative publicity from the attempted assassination resulted in the collapse of the strike. Approximately 2,500 men lost their jobs, and most of the workers who stayed had their wages halved. Frick married Adelaide Howard Childs of Pittsburgh on December 15, 1881. They had four children: Childs Frick (born March 12, 1883), Martha Howard Frick (born August 9, 1885), Helen Clay Frick (born September 3, 1888) and Henry Clay Frick, Jr. (born July 8, 1892). In 1882, after the formation of the partnership with Andrew Carnegie, Frick and his wife bought a home they eventually called Clayton, an estate in Pittsburgh's East End. They moved into the home in early 1883. The Frick children were born in Pittsburgh and were raised at Clayton. Two of them, Henry, Jr. and Martha, died in infancy or childhood. In 1904, he built Eagle Rock, a summer estate at Prides Crossing in Beverly, Massachusetts on Boston's fashionable North Shore. The 104-room mansion designed by Little & Browne was razed in 1969. Frick was a fervent art collector whose wealth allowed him to accumulate a large collection. By 1905, Henry Clay Frick's business, social, and artistic interests had shifted from Pittsburgh to New York. He took his art collection with him to New York, and served on many corporate boards, which brought him considerable opportunity to continue his lifelong business interests. The Frick Collection is home to one of the finest collections of European paintings in the United States. It contains many works of art dating from the pre-Renaissance up to the post-Impressionist eras, but in no logical or chronological order. It includes several very large paintings by J. M. W. Turner and John Constable. In addition to paintings, it also contains an exhibition of carpets, porcelain, sculptures, and period furniture. Frick continued to live at both his New York mansion and at Clayton until his death. Frick purchased the Westmoreland, a private railroad car, from the Pullman Company in 1910. The car cost nearly $40,000, and featured a kitchen, pantry, dining room, servant's quarters, two staterooms, and a lavatory. Frick frequently used the car for travel between his residences in New York City, Pittsburgh, and Prides Crossing, Massachusetts, as well for trips to places such as Palm Beach, Florida, and Aiken, South Carolina. The car remained in the Frick family until it was scrapped by Helen Clay Frick in 1965. Photographs of family and friends travelling on the Westmoreland form part of the Frick archive, as do the original construction plans and upholstery fabric samples. Frick and his wife Adelaide had booked tickets to travel back to New York on the inaugural trip of the RMS Titanic in 1912, along with J.P. Morgan. The couple canceled their trip after Adelaide sprained her ankle in Italy and missed the disastrous voyage. 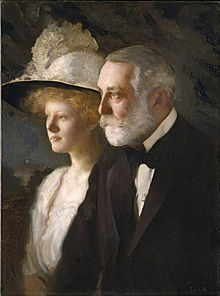 Henry Clay Frick died of a heart attack on December 2, 1919, weeks before his 70th birthday. He was buried in Pittsburgh's Homewood Cemetery. Frick Park gate in the Point Breeze neighborhood of Pittsburgh, PA.
Frick left a will in which he bequeathed 150 acres (0.61 km2) of undeveloped land to the City of Pittsburgh for use as a public park, together with a $2 million trust fund to assist with the maintenance of the park. Frick Park opened in 1927. Between 1919 and 1942, money from the trust fund was used to enlarge the park, increasing its size to almost 600 acres (2.4 km2). Following the death of Adelaide Howard Childs Frick in 1931, the Frick Collection was opened to the public as a museum in 1935. Many years after her father's death, Helen Clay Frick returned to Clayton in 1981, and lived there until her death in 1984. After extensive restoration, this property was also opened to the public in 1990 as the Frick Art & Historical Center. Frick was elected an honorary member of the Alpha Chapter of Phi Mu Alpha Sinfonia music fraternity at the New England Conservatory of Music on October 19, 1917. The Henry Clay Frick archive of business records consisted of the documents regarding the business and financial dealings from 1849-1919. These original documents record the evolution of the period of American steel and coal industrial growth. Documentation includes first business activities, first coal firm, H.C. Frick & Company, to the formation of United States Steel Corporation on March 2, 1901. Correspondence sent and received from prominent businessmen such as Andrew Carnegie, Charles Schwab, Andrew Mellon, Henry Oliver, H. H. Rogers, Henry Phipps, and J. P. Morgan are part of the collection. Much of the collection is available as digitized and openly accessible. Most of the collection is from 1881 to 1914, and is relevant to the history of the Pittsburgh region. Frick's great-grandfather, Henry Overholt (1739-1813) collection is also housed at the Archives Service Center, University of Pittsburgh Library System, University of Pittsburgh. Westmoreland, his private railroad car. ^ "Helen Clay Frick Foundation Archives Finding Aid". Guides to Archives and Manuscript Collections at the University of Pittsburgh Library System. University of Pittsburgh. Retrieved 2 October 2013. ^ "Founded His Fortune in the Panic of 1873"
^ a b c d e f g Candace Falk; Barry Pateman; Jessica M. Moran (2003). "Sample short biographies". Emma Goldman: A Documentary History of the American Years, 1890–1901. University of California Press. Retrieved June 27, 2018. ^ www.n-state.com, NSTATE, LLC,. "Henry Clay Frick - People of Pennsylvania". www.netstate.com. Retrieved 31 March 2018. ^ "The Johnstown Flood, May 31, 1889". glessnerhouse.org. Chicago, IL: Glessner House Museum. May 26, 2014. ^ a b c Wondrich, David (2 September 2016). "The Rise & Fall of America's Oldest Whiskey". The Daily Beast. Retrieved 3 October 2016. ^ a b c Wondrich, David (12 September 2016). "How Pennsylvania Rye Whiskey Lost Its Way". The Daily Beast. Retrieved 3 October 2016. ^ Krause, 1992, p. 354. ^ Krause, 1992, p. 355. ^ Krause, 1992, p. 361. ^ Skrabec, 2010, p. 16. ^ Lowry, Patricia (18 December 2001). "Book assesses Frick family houses, both inside and out". Pittsburgh Post Gazette. PG Publishing Co., Inc. Retrieved 15 December 2014. ^ "selections from the Helen Clay Frick Foundation Archives" (PDF). Helen Clay Frick Foundation. ^ "Henry C. Frick Dies". The New York Times, December 3, 1919. Falk, Candace; Pateman, Barry; and Moran, Jessica M. Emma Goldman: A Documentary History of the American Years. Berkeley, Calif.: University of California Press, 2003. "Founded His Fortune in the Panic of 1873". The New York Times, December 3, 1919. "Henry C. Frick Dies". The New York Times, December 3, 1919. Krause, Paul. The Battle for Homestead, 1890–1892: Politics, Culture, and Steel. Pittsburgh, Pa.: University of Pittsburgh Press, 1992. Petrucelli, Alan W. "A Fresh Look: Viewing Vanka Murals a Religious Experience." Pittsburgh Post-Gazette. July 14, 2008. Skrabec, Quentin R. Henry Clay Frick: The Life of the Perfect Capitalist. Jefferson, N.C.: McFarland & Co., 2010. Tuchman, Barbara (1996). The Proud Tower: A Portrait of the World Before the War: 1890-1914. The Macmillan Company. ISBN 0333306465. Apfelt, Brian. The Corporation: 100 Years of the United States Steel Corp.
Sanger, Martha Frick Symington. Henry Clay Frick: An Intimate Portrait. New York: Abbeville Press, 1998. Smith, Roberta. "Change Arrives on Tiptoes at the Frick Mansion". The New York Times, August 28, 2008. Standiford, Les. Meet You in Hell: Andrew Carnegie, Henry Clay Frick, and the Bitter Partnership That Transformed America. New York: Crown Publishers, 2005. Warren, Kenneth. Triumphant Capitalism: Henry Clay Frick and the Industrial Transformation of America. Pittsburgh: University of Pittsburgh Press, 1996; the standard scholarly biography. Warren, Kenneth. "The Business Career of Henry Clay Frick". Pittsburgh History vol. 73, no. 1 (Spring 1990): 3-15. Documenting the Gilded Age: New York City Exhibitions at the Turn of the 20th Century A New York Art Resources Consortium project. Exhibition catalog of paintings from the collection of Mr. Henry C. Frick, 1908, and 2 letters. "Frick, Henry Clay" . Encyclopædia Britannica (12th ed.). 1922. "Frick, Henry Clay" . The Cyclopædia of American Biography. 1918. "Frick, Henry Clay" . Appletons' Cyclopædia of American Biography. 1900. This page is based on the Wikipedia article Henry Clay Frick; it is used under the Creative Commons Attribution-ShareAlike 3.0 Unported License (CC-BY-SA). You may redistribute it, verbatim or modified, providing that you comply with the terms of the CC-BY-SA.